Moreover, residential solar hot water systems are eligible for a 30% Federal tax credit PLUS state solar rebates and other incentives. By installing a SolaGen™ residential solar system you’ll take control of your energy costs and enjoy all the benefits of obtaining your electricity from a clean, renewable resource: the sun. SolaGen™ offers complete solar hot water solutions for your home utilizing high-quality solar panels for homes and components backed by the longest warranties available. Our SolaGen™ installers will provide the highest quality customer service– service you can count on for years to come. You are already paying for electricity, but what tangible benefit do you have to show for it? Become an owner and invest in your own power plant. The nation’s electricity rates have increased 6.7% annually since 1970. Most experts agree that electric rates will continue to rise faster than inflation. As your own energy provider, you can lock in a portion of your power costs that would prevent future rate hikes from impacting you In fact, a solar power system typically pays for itself in energy savings after 5-9 years. Photovoltaic (PV) solar cells were developed for use in space, where repair is expensive, if not impossible. PV solar cells still powers nearly every satellite in space because it operates reliably for long periods of time with virtually no maintenance. Once installed, the solar power system will provide electricity quietly and cleanly for up to 40 years. Our solar panels come with a 25 year manufacturer warranty on their energy production. Generating electricity from solar energy reduces your consumption of fossil fuels, which decreases pollution and the emissions that are causing global warming. By using solar power, you will help combat global warming, and reduce our nation’s dependence on foreign fuels. 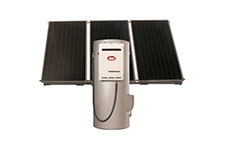 A solar power system has a significant environmental impact. For example, a 5KW solar system reduces CO2 emissions by 10,367 lbs., an amount similar to what would occur by planting .80 acres of trees, or the amount of CO2 emitted by a automobile driving 12,441 miles per year. As the homeowner you can expect a reasonable increase in their homes resale value. An article in the Appraisal’s Journal, October 1999 showed that a home’s value increases $20,000 for every $1,000 saved in annual electricity. Now own a solar electric system that adds value to your home, and provides protection against future electric utility rate increase over the coming years and decades. Solar power systems offer a long term, low risk way to invest your money. In addition to the financial sense of solar power, the environmental benefits are undeniable, thereby making it an investment in to our planet’s healthy future for many generations to come. Solar Power is definitely a big ticket item, but don’t let “sticker shock” stop you from taking advantage of one of the best investments you will ever make. For the average Florida rate payer, not going solar is the more expensive option, especially now with the electric companies asking for fuel rate increases or pass along costs of 16% to 35% .For Example: if you are currently spending $175 per month on electricity, it equates to an annual cost of $2,100. Electrical rates in Florida have increased, on average, 6.7% each year for the last 15 years. This means that next year your bill will likely average $186 per month, and in 10 years the same bill would be $287. If inflation on electrical rates continues at 6.7% for the next 30 years, you will have spent over $178,000 on electricity. The electrical charges associated with the example bill could be reduced by up to 50% or more with our 5KW solar power system. This system would need to be installed in a location with good exposure to the sun ideally south. This 5KW system would have an initial investment of approximately $34,900. There is no doubt this is a big ticket item, but for an investment that is expected to last 30-40 years. Solar power is much less expensive over the long run, and if you finance your system, it becomes more feasible. The following is just one example of the 5KW system size we offer. Our systems range from 5KW to 24KW or more. That the house is facing southwest or southeast with a 5KW system, it will produce an approximate $1,100 of electricity in the first year. This value will rise each year as the electric utility company increases their rates and fuel charges as part of normal energy inflation. By installing a solar power system you are in effect prepaying for 30-40 years of power at a fraction of the cost it would be to pay the electric utility over this time period. As rates increase in the future, the solar power system will lead to even more savings over the life of the system. The Florida Energy Office offers a sizable rebate of $4.00/Watt. This typically represents up to 50% of the cost. In addition, investments in home solar power systems are eligible for a 30% Federal tax credit. Purchasing a solar power system may seem expensive, but financing your system makes it easy and affordable. Unlike most loans, a loan for a solar system is paid for by the money you are saving on your monthly electric bill. We call this cost parity, and that is what makes solar power feasible for the majority of home and business owners. Our financing partner understands solar and has a variety of loan options that will make things a little easier for any situation. Government incentives, tax credits, and electric utility rebates provide a substantial portion of the total solar power system cost. *Not available in all areas. Please check with us to find out if you are eligible for specific promotions and specials.